The End of Your Life Book Club was named one of the “Best Books of October” by O Magazine. Check out the review online or in the print version–on newsstands now! Dani Shapiro gave The End of Your Life Book Club a very nice review in the October issue of More magazine — read it online or check out the print issue! 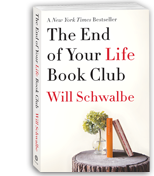 Margaret Quamme at The Columbus Dispatch reviews The End of Your Life Book Club–read it here. The End of Your Life Book Club is getting positive attention in Canada–check out this review in Maclean’s.